This Cordon Bleu Grilled Chicken Dinner recipe is so easy to make and so delicious— you’ll be making it more often than you think! 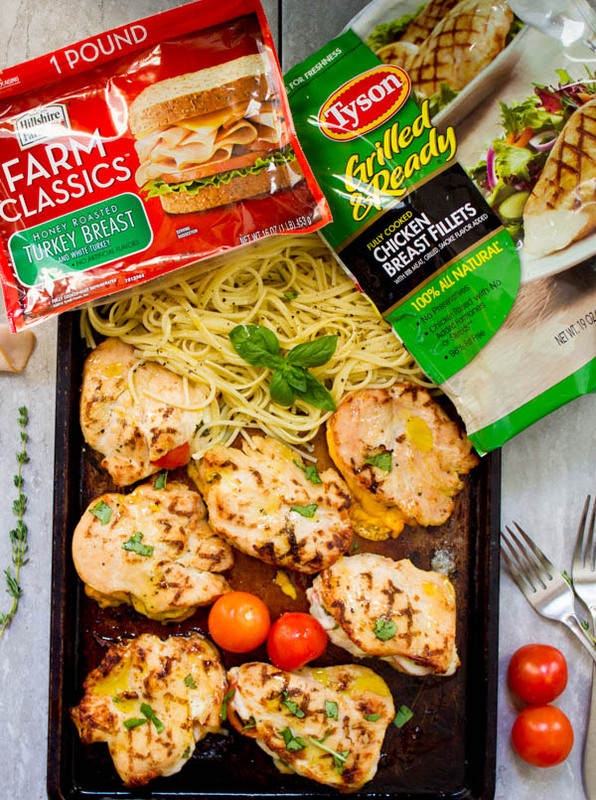 It starts off with succulent grilled chicken breasts that get cut open in half and stuffed with all sorts of your favorite cheeses, deli meats, veggies, herbs —the sky’s your limit. Baked off for just 15 mins, this amazing Cordon Bleu grilled chicken dinner comes out like a fancy gourmet meal that’s easier and quicker than take out! 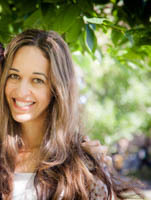 Oh how excited I am to share this recipe—it literally was a life saver at the craziest busiest time for me! As you guys know, I was moving from my condo the last couple of weeks. And moving is NOT fun! Even though I’m moving like 30 mins away, it was such a headache. Now settling down is no fun either and I haven’t really quite settled down yet, but the hardest part is over (I hope). Imagine among all this madness, dinner time needed to be quick, easy, fuss free and super yummy so we all could enjoy it! 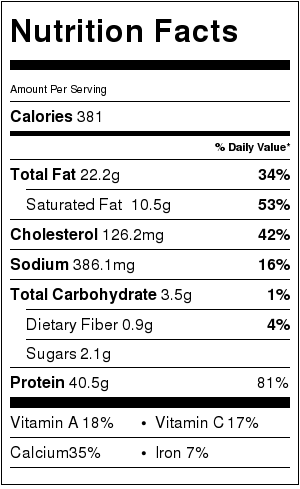 So I tried the TysonⓇ Grilled & Ready® Chicken. You’ll find them at the freezer section in your Walmart Supercenter. 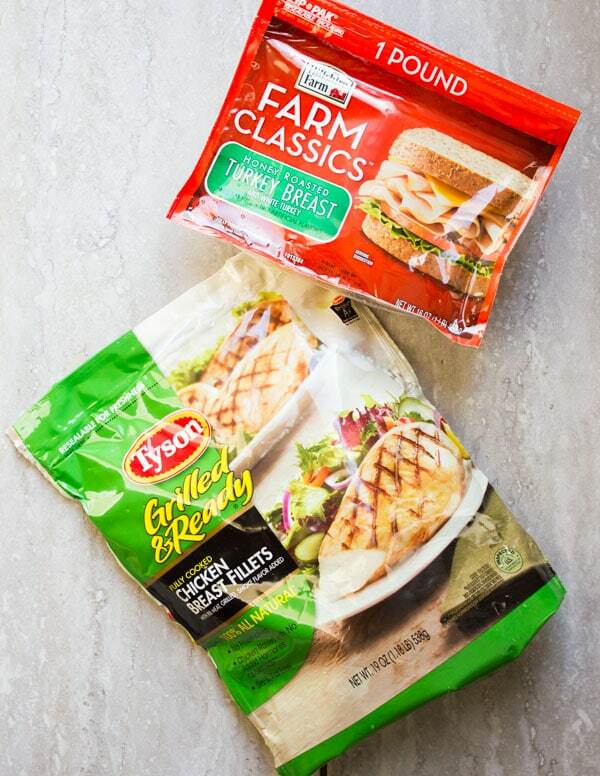 You’ll find so many varieties of the TysonⓇ products that you won’t know which one to pick! 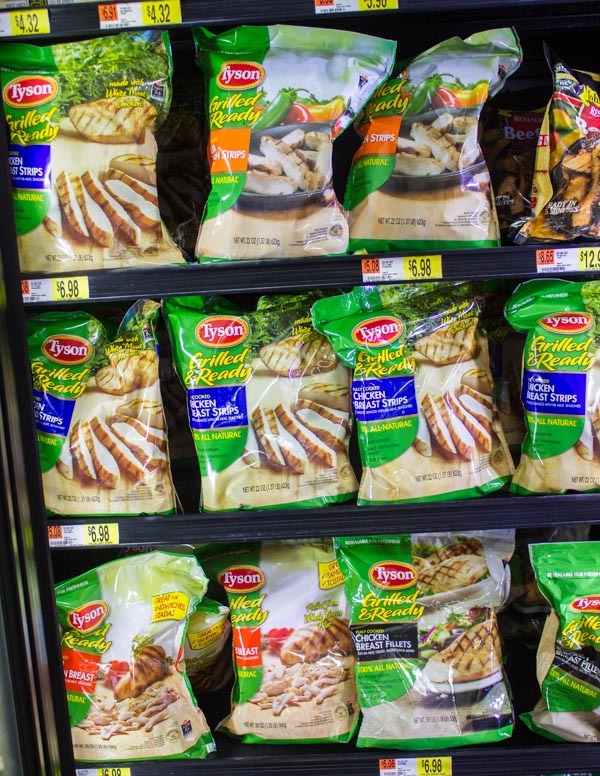 And now with back to school season, they make a perfect choice for busy moms like me 🙂 They’re high in protein, super delicious for snacking or for full meal options, really affordable (I love my Walmart prices)—so it’s the perfect choice! Now have you made Cordon bleu chicken before? and how do you like it—grilled or fried, breaded or not, stuffed with which choice of deli meat and cheese? Today I’m making two awesome versions, none classic, but both oh so good—you won’t miss a thing from the classic! My husband picked Hillshire Farm® Farm Classics® Honey Roast Turkey for the Cordon bleu recipe today. 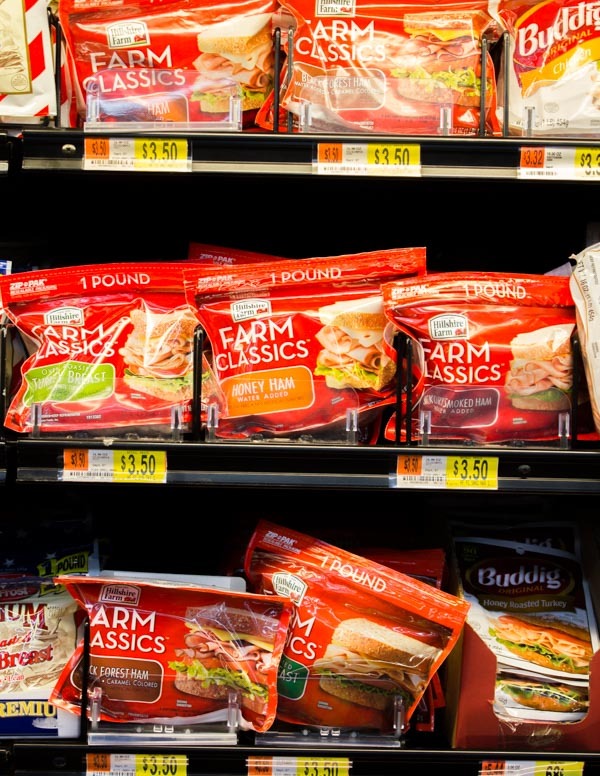 Seriously the variety and quality of Hillshire Farm® lunchmeats are so tempting—I was contemplating a roast beef or smoked turkey, but the Honey Roast Turkey sounded like a perfect match so we went for it. I’ve tried a roast beef version too and it rocked! 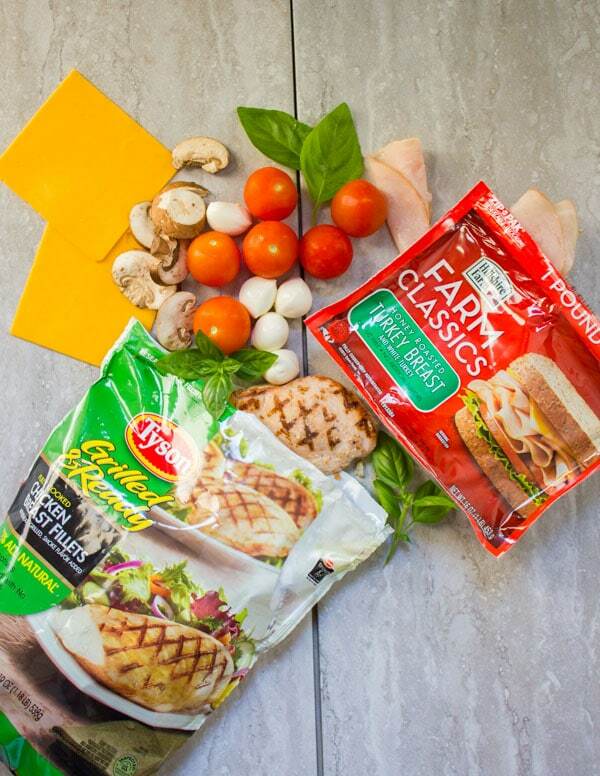 I feel the combo of Cheddar cheese and mushrooms with just a touch of fresh thyme goes really well with the Hillshire Farm® Lunchmeats. The other version I made is my daughter’s favorite. It’s more of a Caprese salad Cordon bleu, so it’s fresh mozzarella, fresh basil and thinly sliced tomatoes. 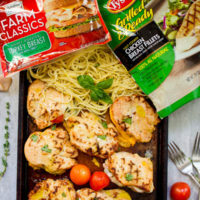 I have to say this version is really yummy too, plus the tomatoes and fresh mozzarella add so much moisture to the chicken. If you’re in a fancy mood, think goat cheese/blue cheese and some fruit like figs , apples or pears with some fresh thyme. So here’s the breakdown of this quick, easy, super fancy Cordon bleu chicken dinner that tastes and feels like you’re dining at a fancy restaurant! 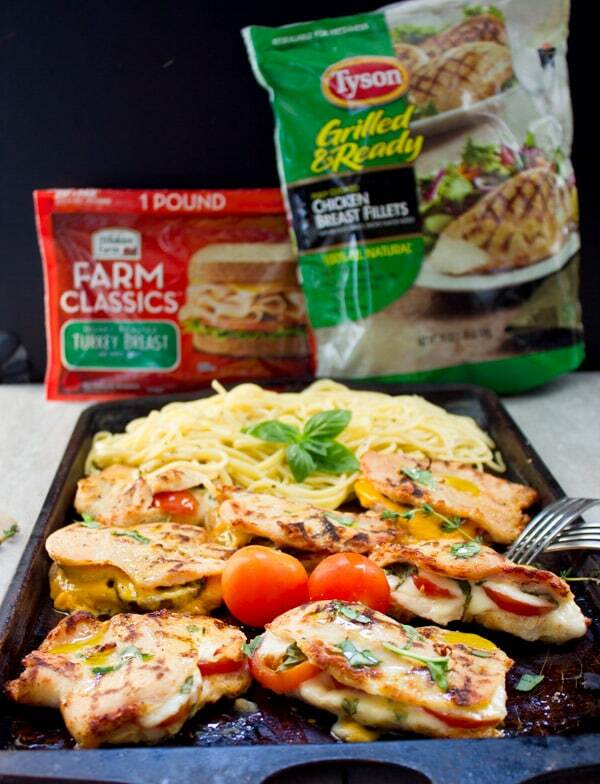 The beauty of using the TysonⓇ Grilled & Ready® Chicken, is that the chicken is so flavorful and already grilled. So you’re basically just free to mix and match any stuffing combo without worrying about the chicken cooking all the way through and any contamination issue. The photos above are best to explain how quick and easy this recipes comes together. 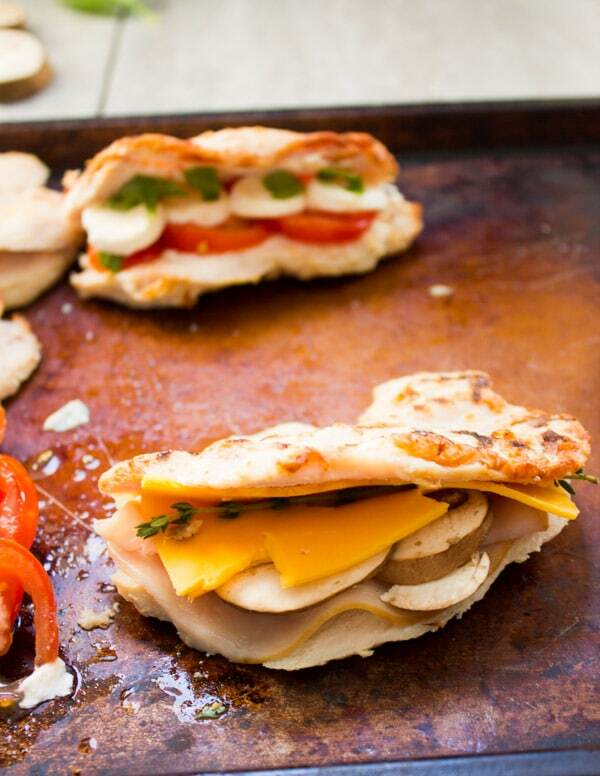 Slice the chicken breast in half but not all the way through—just enough to make a pocket so your fillings can go in. Then layer your fillings, ending with the cheese. Now it’s quite tempting to really over stuff the chicken, but it might all come out during baking. So just go with a nice single layer, and then place the chicken in a single layer on your baking sheet. 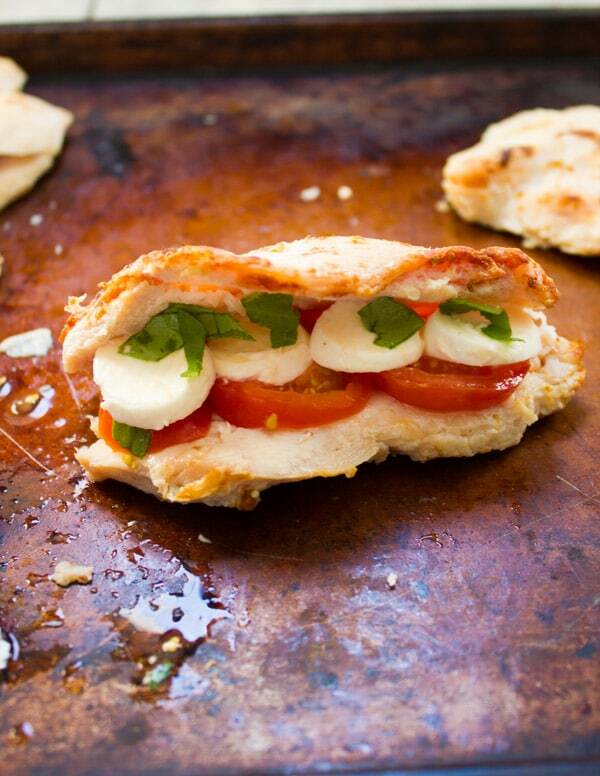 Bake them for just 15 minutes until cheese is melted and chicken is nice and hot. Then drizzle the chicken with a bit of olive oil once it’s out from the oven and it’s ready!! If you make some pasta, salad, rice, roast/potatoes on the side, basically you’ve got yourself a full meal! This Cordon bleu dinner is also fabulous stuffed in a baguette, and just as yummy served cold. If you’re more of a breaded and fried Cordon bleu person, try this healthy and grilled version—you’ll change your mind 🙂 Enjoy! 🙂 And don’t miss the DailyBreak for fun and delicious updates! 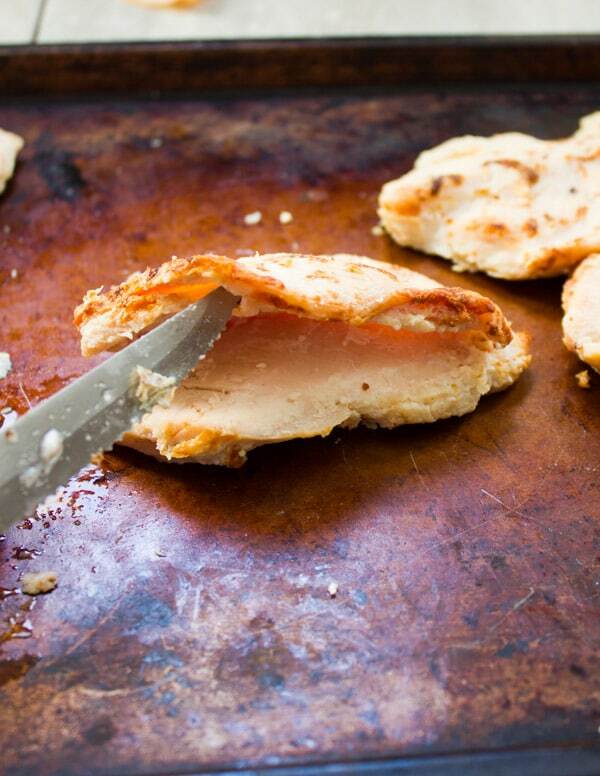 Take each chicken breast and slice it in half but not all the way through, creating a pocket for the filling. 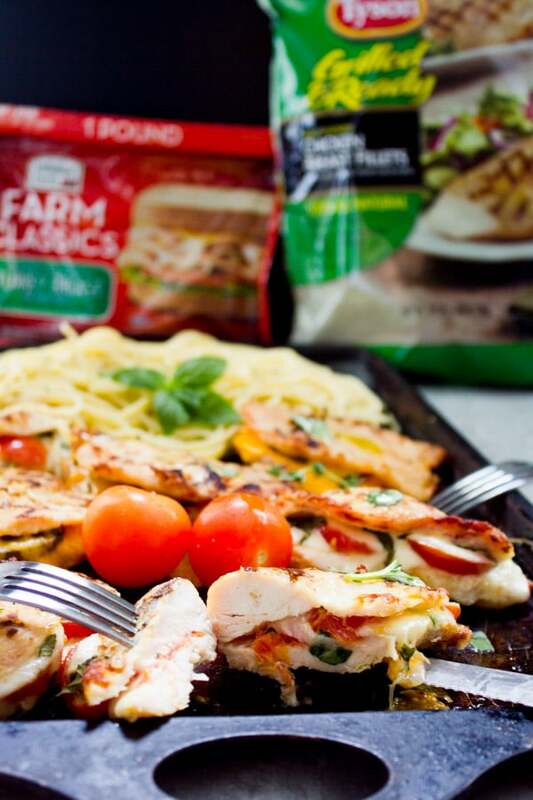 Take half the chicken pieces and stuff them with tomatoes, fresh Mozzarella and basil. The remaining chicken pieces, stuff them with Hillshire FarmⓇ Farm Classics® roast beef, mushrooms and cheddar cheese. 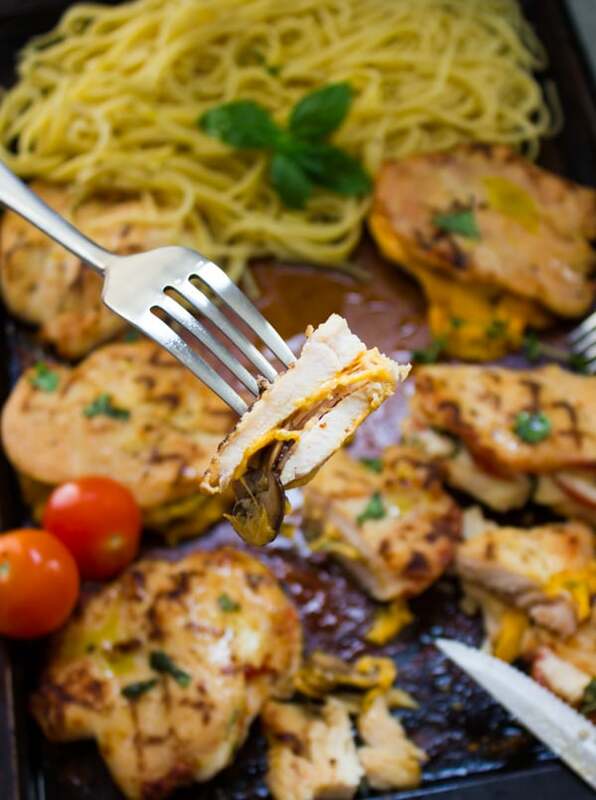 Place the stuffed chicken on a baking sheet in a single layer and bake them for 12-15 mins. 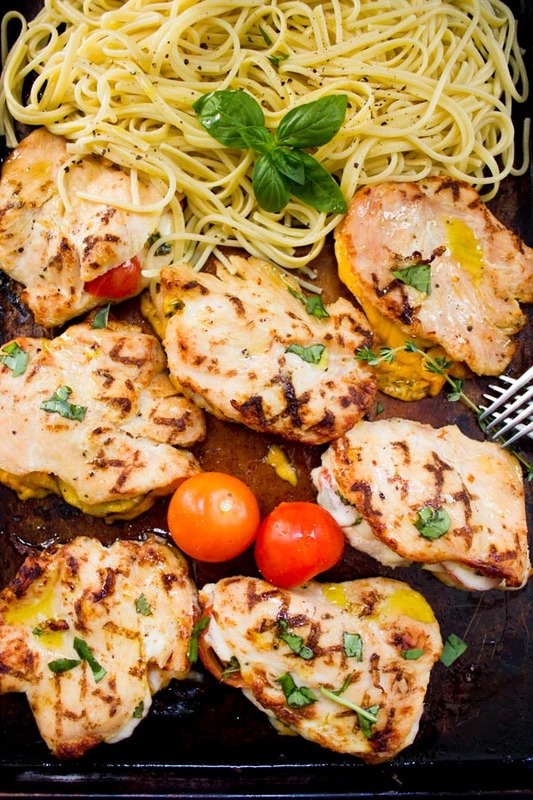 Once the cheese is melted and chicken is ready, remove them from the oven and drizzle the olive oil evenly over all the chicken pieces. Serve with pasta, salad, rice, bread or on its’ own. Enjoy! Oh Janet you will love it! And you’ll make it more often than you think 🙂 Thank you!